Life Freely TV Episode 3: Bringing Back Joy from Shannon Kinney on Vimeo. So much has been going on in my life these days. I have all these creative ideas and I’m feeling totally inspired and then…BOOM. Someone needs me. The “to do” list consumes me. I start feeling overwhelmed…AGAIN. Do you ever feel this way??? And you have that opportunity, too – to embrace a NEW day. To make a change. To let things go. To stop letting the “shoulds” in your head bring you down. In this next episode of Live Freely TV, I talk about bringing back JOY into our daily life. I give 3 simple tips that you can start doing NOW to feel better in your day, and therefore, return to a sense of gratitude, peace and JOY in your life. 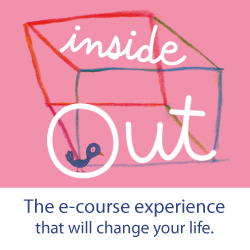 I’ll be introducing you to all of the AMAZING guest coaches, artists, writers and healers who will be sharing their expertise in the upcoming ALL NEW Inside Out! AND…BIG GIVE-AWAYS are coming up, too. I can’t wait to share with you!! ALSO, WANT TO CHAT LIVE? A few weeks ago I mentioned that I’m giving Periscope a try. MAN…I’m learning a ton about it, including how it is bringing up my FEARS! I will be sharing some simple art journaling tips on my Periscope channel, along with other inspiration on making space for creativity, finding peace inside your day and how to quiet your negative thoughts so you can live a wonderfully authentic, full life. Sign-up for Periscope. (Download the app on your smart phone – create a login.) Then, follow me @ A Free Spirit Life. Once you follow me, you’ll be notified when my broadcasts will be going LIVE. Then we can CHAT in REAL TIME! It’s all new to me – so I kind of feel scared about it – but we need to do things that scare us – right? SO I’m totally going to give it a try. AND I want you to join me too! e-course & community registration is NOW OPEN. This time, when you register, you get access to the course content for ONE YEAR and membership to our community for a lifetime. Click HERE for all the wonderful info.